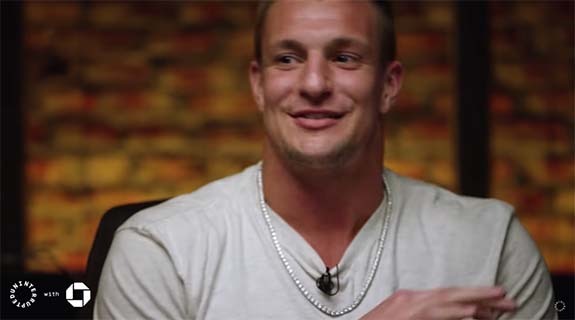 Despite being one of the highest-paid players in the NFL, New England Patriots tight end Rob Gronkowski says he lives an “easy” and “normal” life. Gronk is famously frugal and claims he has never treated himself to a guilty pleasure — until now. While appearing on the internet show Kneading Dough, the 6′ 6″ 265-pound powerhouse gushed about his very first luxury purchase — a diamond-studded necklace. “I love this puppy,” he said with a giddy grin. “So last week, I finally went out and bought myself a chain,” he beamed. “It looks good, too,” added Carter.